Aqualite outdoor LCD and LED waterproof. all weather, TV advertising and signage display screens offer the highest possible visability for outdoor advertising campaigns, ensuring your marketing messages reach the target audience at this summer’s outdoor events. 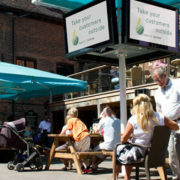 Aqualite Outdoor have worked closely with our distributors to develop the latest outdoor, all weather LCD and LED digital display panels and waterproof TV screens that help companies keep their customers entertained outside and informed in an efficient and cost effective manner. Aqualite Outdoor LCD & LED TV screens can be used for outside event advertising displays or as part of an external digital signage system to manage car park queues or direct customers and passengers in busy reception areas at outdoor events such as music or arts festivals, garden centres, shopping malls, airports, train stations, schools, colleges, universities, outdoor events, trade shows, exhibitions, race courses, sporting events, stadiums, swimming pools, zoos, tourist attractions and theme parks. For more details of the AQLS, AQLH, AQLS-PC and AQHS-PC range of outdoor, waterproof TV advertising display screens, panels, displays & monitors, for UK and European trade and export enquiries or to find your local Aqualite Outdoor TV screen supplier, distributor or installer please telephone 00 (44) 207 586 6374 or contact us.